Oranges never cease to please me, with their bright summery hue, burst of citrus fragrance, or the way a slice cools my parched throat on a warm day, they always were and will be at the top of my fruit favourites list. Back in the good old days in the early nineties, I recall a lazy afternoon, as I sat on the balcony brushing my grandmother's hair, an orange vendor rolled into our colony in his wooden wheeled cart with a promise of ripe juicy fruits at a throw away price. With the thrill an enthusiasm of a six year old, I requested my grandmother to allow me to go down and purchase some. She however refused to let me go down but instead descended a basket tied with a string (a common practice in our parsi colonies) from our second storey balcony and asked the vendor to fill it with three dozen oranges. My little heart knew no bounds as I jumped with glee and happily planted a few kisses on my granny's cheeks, before proceeding to devour most of the days 'loot'. A lot has changed on the fruit and vegetable scenario since that bright summer afternoon, India has seen an influx of hybrid produce along with the availability of produce previously only seen on foreign T.V. channels but never available here in India. One such paradigm shift has been that of a variety of oranges, which are now seen in Indian markets more so than the traditional Nagpur Narangis (locally available variety of orange). 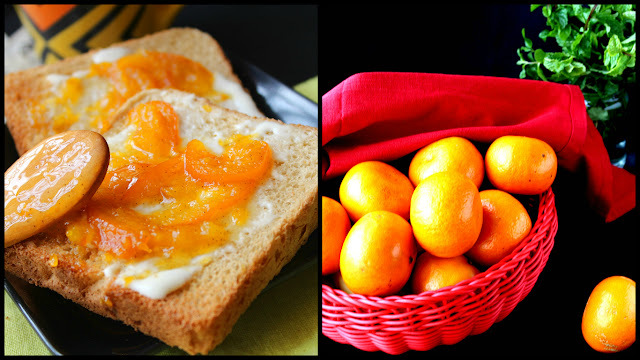 India now grows several varieties of oranges, differentiated by their sweetness and exterior. In fact, The National Research Center for Citrus in Nagpur, India cites that the country houses a staggering 1,505 types of citrus. Though limes, Seville oranges, sweet limes, lemons and mosambis are technically Citrus sinensis. Last December as I put up a recipe for strawberry jam here on the blog, I decided that my next preserve would be a marmalade and to my utter delight a lot of my friends requested me to put up a recipe as well. So I set off to my trusty neighborhood fruit vendor in search of some smooth skinned bright maltas, since they are the juiciest in my opinion and their rind is a lot less bitter as well. The recipe that I'm sharing today is rather simple to execute, but its USP lies in the bursts of orange juice as you bite into the succulent rinds. 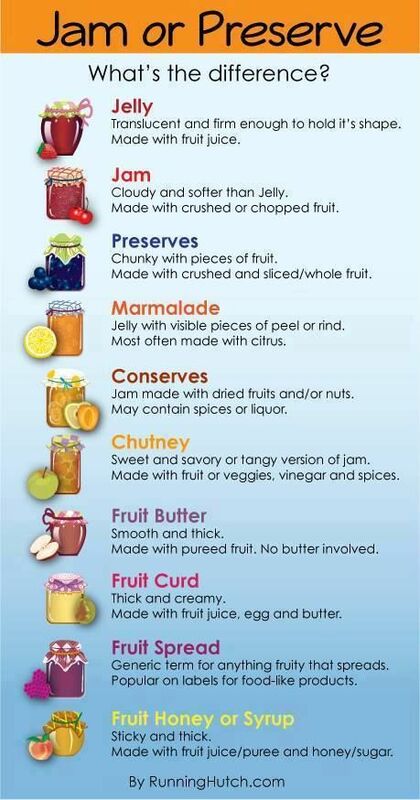 Truly a star recipe to keep in your culinary aresanal and one that will put you off store bought marmalade for life. Do try it and let me know in the comments below. Start by peeling the oranges and removing the seeds, next thinly slice the peels into juliennes and keep aside. In a large pot, bring orange pulp and sliced rinds along a vanilla pod slit in half with 4 cups water to a boil over high. Reduce heat to medium and cook at a rapid simmer until orange peels are tender, 20 minutes. Add sugar, increase heat to medium-high, and stir until sugar dissolves and returns to a boil. Cook, stirring often until mixture is thick and darkens slightly, 45 to 60 minutes (reduce the heat a bit if your mixture is boiling too vigorously to avoid burning) . 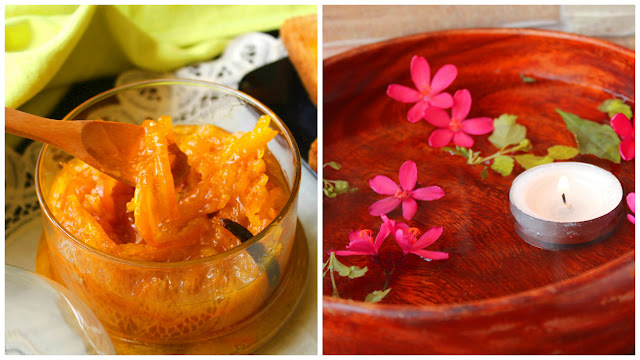 Transfer marmalade to airtight containers, cover, and let cool completely. To store, refrigerate for up to a month, or freeze up to 6 months.